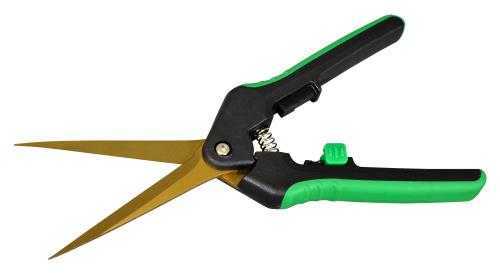 The Shear Perfection® 3 inch Straight Trimming Shear has extra long titanium coated stainless steel blades, giving gardeners massive coverage of their plant in a small period of time. The titanium coated stainless steel blade will stay sharp during multiple uses and is very easy to clean. This shear includes a comfort grip handle with spring loaded action for less fatigue on your hands. Storage is simple with an easy-lock mechanism. For right or left handed use. Overall length is 7.5 in.